Microsoft isn’t slowing down on its promise to deliver monthly updates to Xbox One. The team in Richmond has cooked up an extra set of feature updates called the Creators Update that will offer a new look for the home screen, improvements to Cortana and accessibility updates that’s going to greatly improve the Xbox experience for gamers with special needs. The update is rolling out first to members in Microsoft’s Insider program starting this month, and then to the larger Xbox One community sometime down the road. 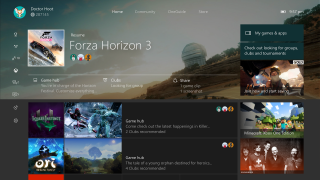 Spearheading the update are the changes to the Xbox One home screen. This area saw some major improvements when Microsoft switched over to the New Xbox Experience (NXE) last year, and will now offer better access to the games and apps section, as well as to Twitch and Game DVR. According to the Xbox Wire, the changes were made to reduce complexity and require less button presses to get where you want to go. Specifically that will mean smaller game icons and more room for the title’s Game hub page. You’ll also be able to quickly reach a game’s Looking for Group section. Press the center jewel and Microsoft says that Insider members will be greeted to “a faster and more intuitive guide”. The guide will open with your recent games and apps, a set of controls for background music and any pins you use. Here’s a video that walks you through all the changes. Improvements to the user interface are great, but Microsoft’s latest update is also targeting gamers with special needs. The feature on display in the video is called Copilot and it will allow families and friends to use two controllers simultaneously as one input. Need someone to press ‘A’ while you move the left joystick? Now you’ll be able to make that happen. Microsoft also plans on updating Magnifier and Narrator, as well as giving more options over audio output and custom rumble settings on a controller. Finally, for audio fans, Microsoft is enabling bit-stream audio pass-through for Blu-rays, meaning you can finally get Dolby Atmos to work via Xbox One.